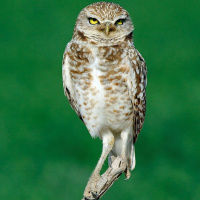 The Burrowing Owl is a small ground-dwelling owl with long legs, a round head and no ear-tufts. Typical calls - Guayas, Ecuador. July 1992. CC Niels Krabbe. Typical calls - Goiania, Brazil. May 2009 © Nunes D'Acosta. Alarmed - Goiania, Brazil. © Nunes D'Acosta. Description: The facial disc is pale brownish with prominent white eyebrows above the bright yellow eyes. The bill is greyish-olive and the cere greyish-brown. There is a distinct whitish throat band. Upperparts are brown, with the forehead and crown having whitish streaks and dots. Elsewhere is irregularly dotted whitish to pale ochre with relatively large, rounded spots. Flight feathers are barred light and dark, and the tail is brown has 3-4 pale bars. Underparts are whitish to pale buff with dense dusky brown bars. Tarsi are conspicuously long and sparsely feathered. The olive-grey toes are bristled, and the claws are dark horn with blackish tips. Females are usually darker than the males. Size: Length 19-28cm. Wing length 142-200mm. Tail length 64-114mm. Weight 147-240g. Females are larger and heavier than males. 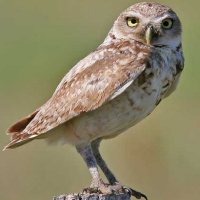 Habits: Burrowing owls generally active at dusk and dawn, but sometimes at night also. They are highly terrestrial, and are often seen perched on a mound of dirt, telegraph or fence post - frequently on one foot. They bob up and down when excited. 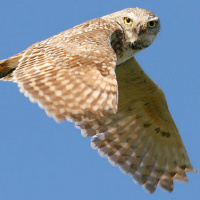 Flight is with irregular, jerky wingbeats and they will frequently make long glides, interspersed with rapid wingbeats. 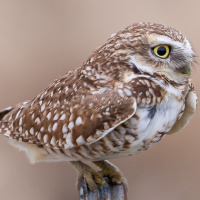 Burrowing Owls are comparatively easy to see because they are often active in daylight, and can be surprisingly bold and approachable. 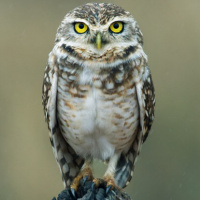 Voice: Burrowing Owls are very vocal, and have a wide range of different calls. The main song of the male is a hollow "cu-cuhooh" which varies individually and according to the state of excitement of the bird. The female has a similar but slightly higher-pitched call. Both sexes will give a chattering "kwekwekwekweeh" when alarmed, which can increase in volume to a loud, harsh "jaket-jakaket... gowaeh-keket-gowaeh", or a wooden rattle similar to a rattlesnake. A screeching "chreeh-ketketket" is also uttered in similar situations. A clucking "chee-gugugugugug" apparently has a contact function. If young are disturbed at the nest, they will hiss, as well as make dry rattling sounds similar to a rattlesnake. 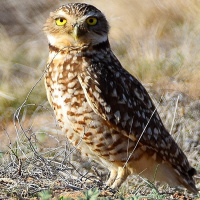 Hunting & Food: Burrowing Owls feed on a wide variety of prey, changing food habits as location and time of year determine availability. Large arthropods, mainly beetles and grasshoppers, comprise a large portion of their diet. Small mammals, especially mice, rats, gophers, and ground squirrels, are also important food items. Other prey animals include: reptiles and amphibians, scorpions, young cottontail rabbits, bats, and birds, such as sparrows and horned larks. 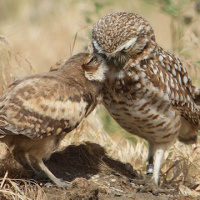 These Owls are quite versatile in the ways they capture prey. 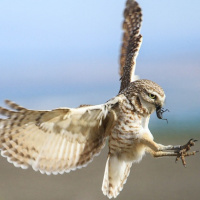 They chase down grasshoppers and beetles on the ground, use their talons to catch large insects in the air, or hover in mid-air before swooping down on unsuspecting prey. They also watch from perches, then glide silently toward their target. 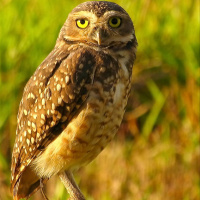 Burrowing Owls are primarily active at dusk and dawn, but will hunt throughout a 24-hour period, especially when they have young to feed. Breeding: The nesting season begins in late March or April. 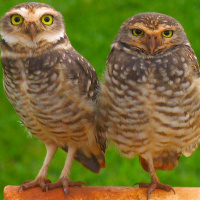 Burrowing Owls are usually monogamous but occasionally a male will have 2 mates. Courtship displays include flashing white markings, cooing, bowing, scratching and nipping. The male performs display flights - rising quickly, hovering for 5 to 10 seconds, then dropping. This sequence is repeated many times. Circling flights also occur. 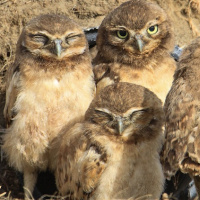 Burrowing Owls nest underground in abandoned burrows dug by mammals or if soil conditions allow they will dig their own burrows. They will also use man made nest boxes placed underground. They often line their nest with an assortment of dry materials. Adults usually return to the same burrow or a nearby area each year. 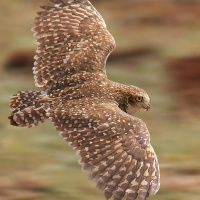 One or more "satellite" burrows can usually be found near the nest burrow, and are used by adult males during the nesting period and by juvenile owls for a few weeks after they emerge from the nest. 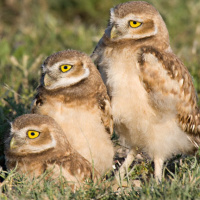 Burrowing Owls have been reported to nest in loose colonies. Such groupings may be a response to a local abundance of burrows and food, or an adaptation for mutual defense. Colony members can alert each other to the approach of predators and join in driving them off. During the nesting season, adult males forage over a home range of 2 to 3 square km Ranges of neighbouring males may overlap considerably. 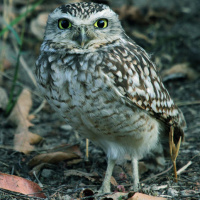 A small area around the nest burrow is aggressively defended against intrusions by other Burrowing Owls and predators. 6 to 9 (sometimes up to 12) white eggs are laid a day apart, which are incubated for 28-30 days by the female only. The male brings food to the female during incubation, and stands guard near the burrow by day. The care of the young while still in the nest is performed by the male. At 14 days, the young may be seen roosting at the entrance to the burrow, waiting for the adults to return with food. They leave the nest at about 44 days and begin chasing living insects when 49-56 days old. 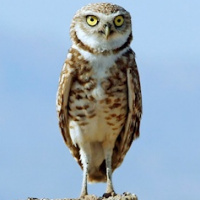 Mortality: Burrowing Owls are able to live for at least 9 years in the wild and over 10 years in captivity. They are often killed by vehicles when crossing roads, and have many natural enemies, including larger Owls, hawks, falcons, badgers, skunks, ferrets, armadillos, snakes, and domestic cats and dogs. 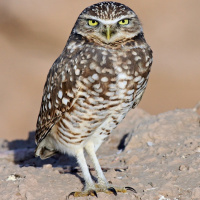 Habitat: Burrowing Owls are found in open, dry grasslands, agricultural and range lands, and desert habitats often associated with burrowing animals, particularly prairie dogs, ground squirrels and badgers. They can also live in pinyon and ponderosa pine habitats. They commonly perch on fence posts or on top of mounds outside the burrow. 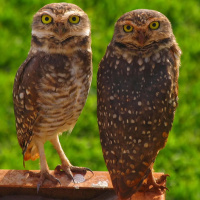 Distribution: Burrowing Owls are present in North America, and breed across the grassland regions of southern Alberta, Saskatchewan and Manitoba. They occur in all states west of the Mississippi Valley, breed south through the western and mid-western States. A separate subspecies is found in Florida and the Caribbean Islands. 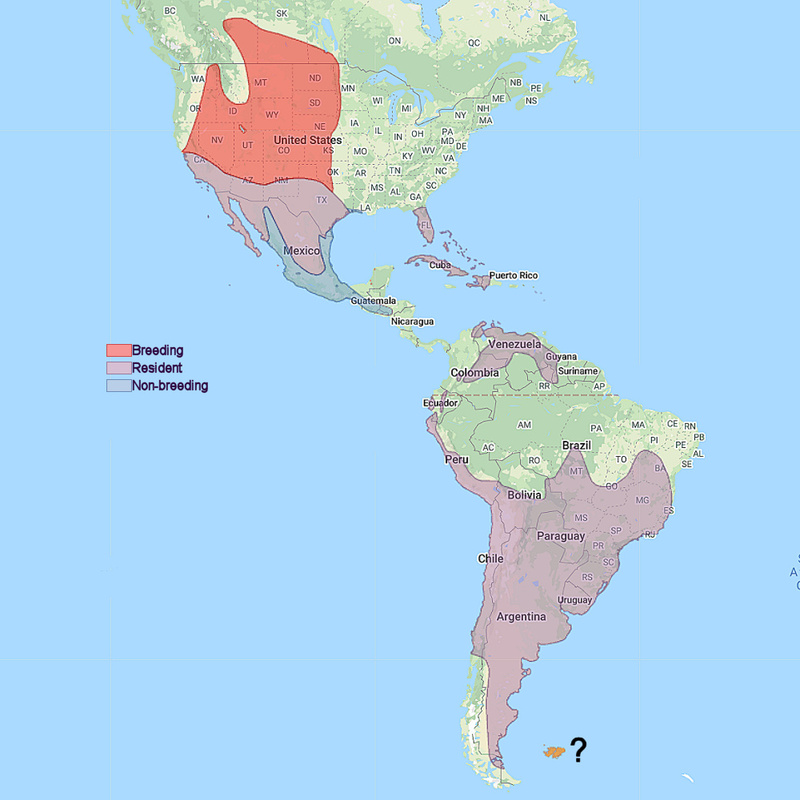 They extend south into Mexico, Central America and South America but populations have declined in many areas due to human-caused habitat loss or alteration. Birds from the northern part of the U.S. and Canada are migratory. Status: Uncertain. Locally frequent, but otherwise rare. Original Description: Molina, Giovanni Ignazio [Juan Ignazio]. 1782. Saggio sulla storia naturale del Chile (Saggio Storia Nat. Chile): p. 263. Campbell, Wayne. 1994. "Know Your Owls". Axia Wildlife. Duncan, James R.. 2003. 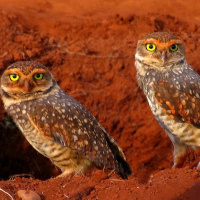 "Owls of the World: Their Lives, Behavior and Survival". Firefly Books. König, Claus & Weick, Friedhelm. 2008. "Owls: A Guide to the Owls of the World (Second Edition)". Yale University Press. König, Weick and Becking. 1999. "Owls: A Guide to the Owls of the World". Yale University Press. Long, Kim. 1998. "Owls: A Wildlife Handbook". Johnson Books. Mikkola, Heimo. 2013. "Owls of the World: A Photographic Guide (Second Edition)". Bloomsbury. 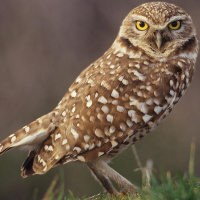 See also: Other owls from North America, Central America, South America, Genus: Athene. Page by Deane Lewis. Last updated 2015-11-30.